This morning, I headed to the Space Coast Regional Airport near Titusville, FL, for a flight on the ZeroG plane. This is a modified Boeing 727 with 7 rows of seats in the back and the rest of the compartment has padded floors, walls and ceiling. After a short briefing, they broke us up into groups, took some group photos and led us onto the plane. The video emphasized things like no "facilities" on board, what to do if you start to feel nauseous but mostly what to expect and some things to try. The plane achieves zero G by flying up and down between 24,000 ft and 32,000 ft in a block of airspace reserved for the flight roughly 10 miles wide and 100 miles long over the Atlantic. During the top, they fly a parabolic path and you have 20-30 seconds of weightlessness. On the downhill portion, gravity returns and they have everyone lay down on the floor for the lower parabola where you experience a couple of G's. They don't have to tell you when you are weightless since you just start floating up off of the floor. For the first parabola, they do it so you experience martian gravity or about 1/3 G. During this time we tried pushups (easy one handed pushups!) then walking around. On the second parabola, they simulated lunar gravity or 1/6 G (easy one finger pushups!). The next twelve parabolas were zero G maneuvers. I don't think I've ever felt so out of control as the slightest push will send you barreling across the plane spinning wildly. By extending your arms and legs, you can slow down the spinning. I only tried to video for the first couple of parabolas. After that, I agreed with their recommendation that it is a waste of effort and to just let them handle the photography. They had a bunch of HD cameras mounted on board as well as a professional photographer. The "official" pictures and videos will be out in a week or so. We got to do the traditional things such as trying to grab candies and globs of water mid-air (I wasn't too successful). There was a BBC camera crew on board filming a different group as part of some show and our group had a Discovery Channel reporter (no camera crew). I ended up sitting out the last three parabolas due to queasiness but I would definitely recommend this trip to anyone. This is so cool. 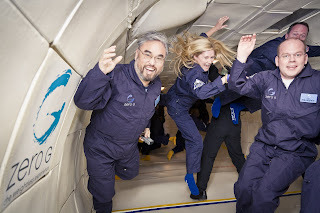 I am sure not many share that special experience of zero G. Thanks for sharing this unique adventure. I've seen discovery channel type reports on this ride....very cool, though I wonder how many collisions with your fellow passengers? wow, you are so brave. It was over the top fun. I don't understand the "brave" comment as I really don't see much risk. There was a fair number of collisions thoug some actually figured out the right amount of force needed to move gracefully across the cabin. I was in the generally in the "push too hard" category. The best part of the one-finger pushups is the ability to push yourself up to a standing position. So fun! I'm jealous! Adding the Zero G flight to the list. Who would have thought you were such a wild man?